Description: The all new Dine-Aglow Diablo Butane Lighter is the ultimate heavy duty lighter. Designed specifically for the food service and hospitality industries, this butane lighter is loaded with features. 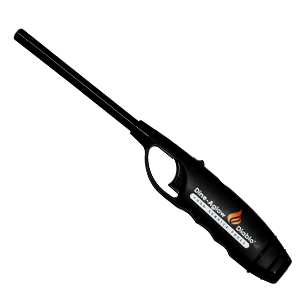 This extremely durable butane lighter features a longer barrel for safer reach, advanced technology electronic ignition, adjustable flame height, extra-large fuel supply, visible fuel supply and a child resistant safety lock. A case of 60 pre-packed lighters two per card with a barcode for individual retail sale, 120 lighters per case.